Aerotowing may appear to be a benign method of getting airborne in a glider, but there are inherent hazards, the most significant of which are detailed below. Pilots should be dilligent in carrying out the pre-flight checks and remain vigilant throughout the launch. Distraction is a major cause of accidents; pilots should not allow themselves to become distracted during the pre-flight checks and the tow. Navigation devices, radio, FLARM, loggers and cameras should be switched on and set up before carrying out the pre-flight checks. Airbrakes opening during an aerotow have led some glider pilots to make an incorrect assumption about tug performance and/or sinking air. 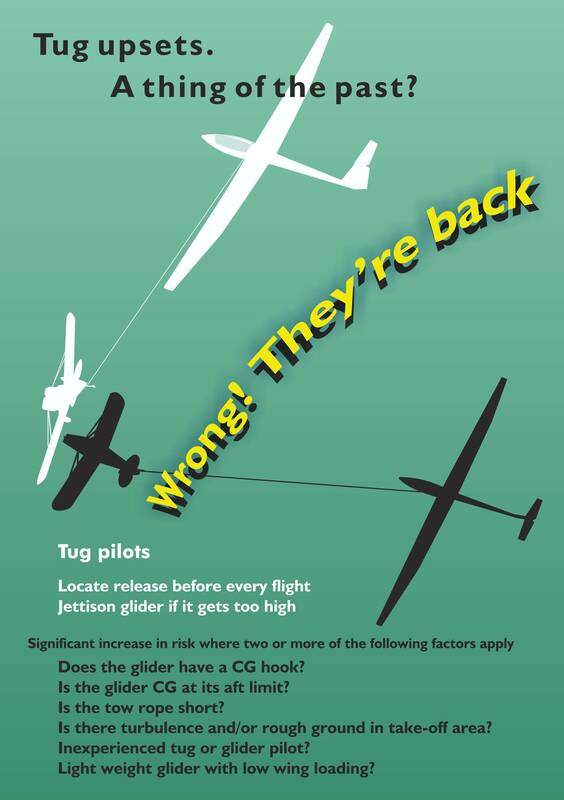 If a glider is not climbing as expected on tow, the glider pilot should look and physically CHECK that the airbrakes are locked (plus correct flap setting and drag chute not deployed). 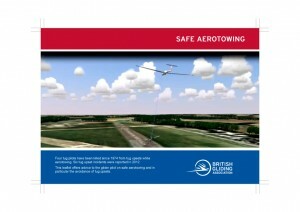 The BGA publication ‘Managing Flying Risk’ is a particularly important read for anyone involved with aerotow operations. 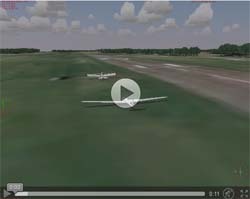 Personal injury accidents to the glider pilot while aerotowing are rare but the tug pilot can be killed if the glider gets too high and forces the tug into a vertical dive. A previous educational campaign on safe aerotowing followed several fatal tug upset accidents between 1978 and 1985. The fatal accidents stopped, and the frequency of tug upset incidents diminished and remained at less than one per year until 2008. Since 2009, however, there has been an average of 3 upsets per year. In one of the 2012 incidents the tug pilot recovered 100ft above trees. In another incident, in 2013, the tug pilot recovered 40 ft from the ground. In 2014 another incident resulted in the tug impacting the ground at a 45° nose-down angle. If you are inexperienced, do not aerotow on a belly hook and do not aerotow in turbulent conditions. Maintain the correct vertical position of the tug in the canopy. Do not allow the glider to get too high. If you are too low behind the tug shortly after the tug take off, or at any other time, move back into position SLOWLY. Being lower than the tug is not dangerous. An upset can follow if you pull up quickly. Release immediately if the glider is going high and the tendency cannot be controlled, or you lose sight of the tug. Fly the glider! Leave any potentially distracting problems with instrumentation or ventilation until after release. Leave the undercarriage down. At release height, is it clear? Pull the release, visually ensure the rope has separated from the glider, and raise the nose slightly before making a turn. 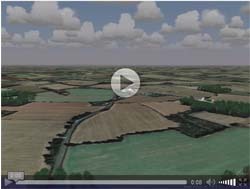 The leaflet contains stills from the video simulations of tug upsets that can be found on this page. 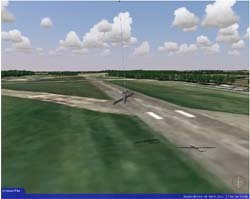 Aerotow takeoff and climb performance can be affected by a number issues associated with the towing aircraft or glider – or a combination of both. 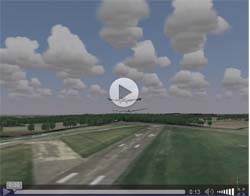 The BGA publication ‘Aerotow Performance’ provides guidance. The handling of many gliders on aerotow is inferior to the handling of the same glider in free flight. Gliders with a large span may be particularly susceptible. Inferior handling on tow arises because the downwash behind the tug wing strikes a similar span of glider wing and reduces its angle of attack. The glider pilot has to increase the angle of attack of the whole wing in order to generate adequate lift. This action increases the angle of attack of the outboard part of the glider wing, with the result that the stability advantages of washout are diminished or lost, and the glider wing tip can stall before the root. Unless the pilot responds immediately, the resulting loss of control can result in uncommended roll leading to a spin – which with inadequate height to recover could be fatal. The severity of the effect varies between different glider-tug combinations and that needs to be considered during the eventualities brief; the achievable speed could initially be limited by the available take-off run, headwind and grass or runway conditions. And there are sometimes very few options if the glider becomes uncontrollable in the early part of the climb-out. The solution is to fly faster – at least the minimum recommended towing speed for the type of glider and weight – and on a suitably long rope. 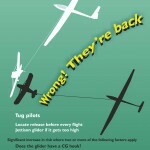 This leaflet offers advice to the glider pilot on safe aerotowing and in particular the avoidance of tug upsets. If the glider is too low the pilot should move back into position SLOWLY. These two clips show how moving back into position too rapidly can cause the tug to crash even though the glider is using a nosehook. This simulates the classical upset that can be fatal for the tug pilot. The glider on a belly hook gets too low, the pilot pulls back, and the glider climbs uncontrollably. Note how rapid the climb is. 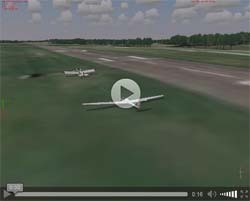 If the glider pilot fails to release after a wing drop the tug may depart from the runway. A late release after a wing drop may cause the glider to goundloop.